If you are a rookie when it comes to tofu, take heart. 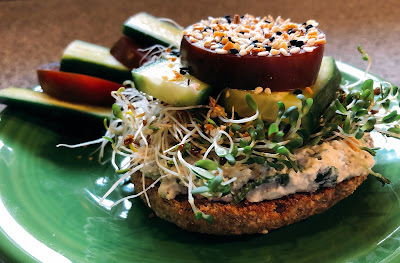 Here's a simple Husband-Tested Recipes step-by-step tutorial on how to prepare it. Tofu is low in fat and carbs, has no cholesterol, and is high in protein, calcium, magnesium and iron. One 16 oz. 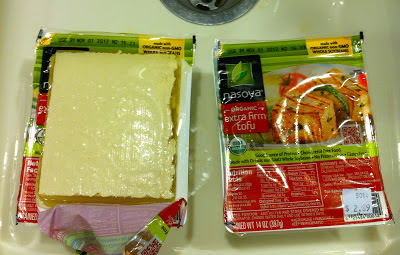 package of Organic Nasoya Extra Firm Tofu (which has four servings) costs less than $3.00 at Lost River Market & Deli. You will find it in the refrigerated section of the store, so keep it chilled at home. It's packed in a container filled with water. To keep from making a watery mess, place the package in a clean sink. Using a knife or scissors, cut off the plastic top. Drain off the water. 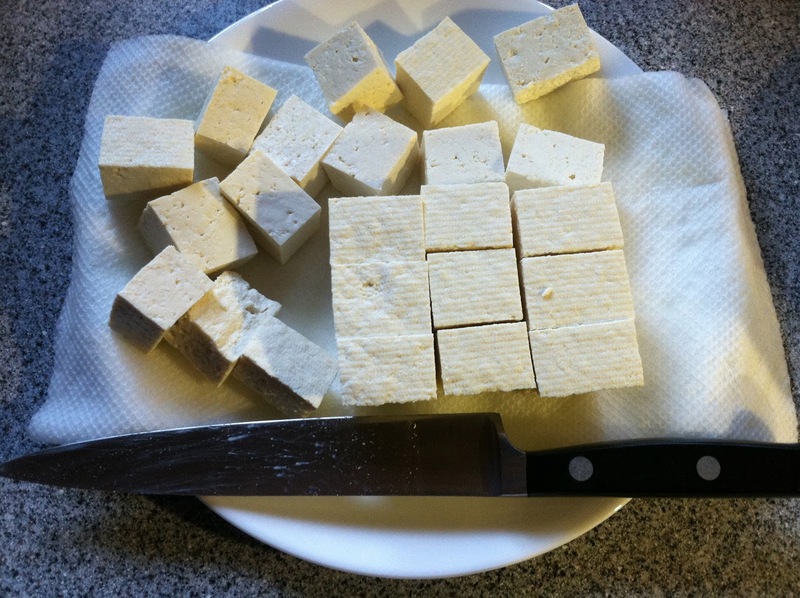 For each block of tofu, you will need two plates and some paper towels (or clean dish towels.) Place a paper towel folded over onto a plate. 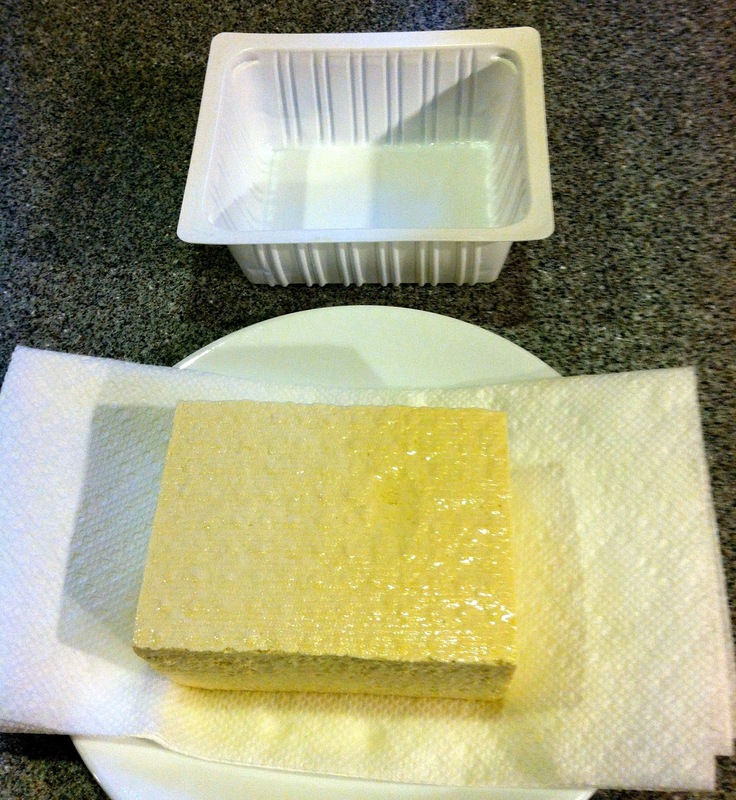 Place another folded over paper towel on top of the block of tofu. Put another plate on top of the stack. Place a heavy can on top of the plate. This will weigh down the tofu and help remove excess moisture. Why? Tofu is tasteless, so you will want the tofu dry so that it absorbs the flavors of any marinade you make. After about an hour or so, remove the can, the top plate and the top paper towel. The paper towels will be totally soaked through with liquid and your tofu will be dry. It is now ready to add to whatever dish you wish to prepare. Now, here's a great Husband-Tested Recipe for Marinated Baked Tofu. First, cut the tofu into 1" cubes. Add the tofu cubes to a container that has a tight-fitting lid. Pour marinade over tofu and cover with the lid. 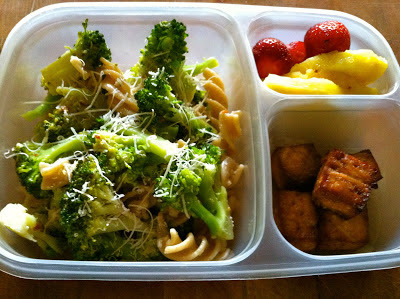 Refrigerate overnight, turning the container over occasionally so that the marinade completely covers the tofu. Place the tofu cubes on a rack set on parchment paper. Preheat oven to 350 degrees. Bake at 350 degrees for 50 minutes, flipping tofu (with tongs) once about halfway through the cooking time and brushing with the remaining marinade. Here is the baked tofu still hot from the oven along with SesameSoba Noodle Salad. 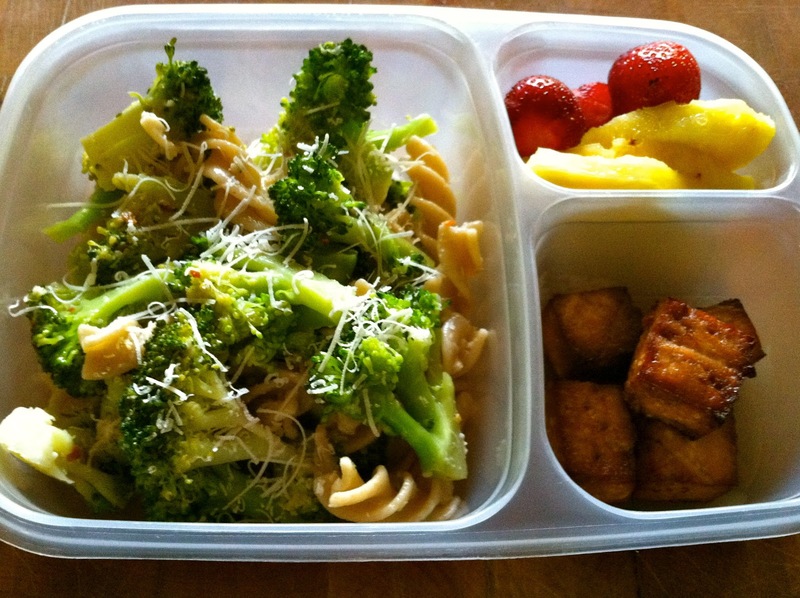 This tofu tastes quite good cold and makes a super addition to your lunchbox for Meatless Monday. This looks great! I will certainly try your marinating/baking technique. I love the color you're able to get. I like to press my tofu by putting it in a large fine mesh colander. I put the colander in a shallow bowl to catch the pressed water. And then a plate goes on top of the tofu, with a couple pounds of dried beans or rice, whatever I have that's in a bag (because I've had canned goods fall off the plate during the process!) It works really well, and then you don't have to waste paper towels or have the tofu sitting on something damp. Hi! 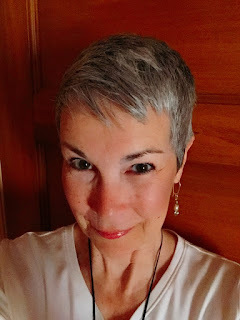 I made this and then had to blab about it all over Facebook! With pictures of my dish! I ended up having 3 people ask for the recipe. Very very good. Thanks so much. My family and I are transitioning to vegetarians and lets just say, my husband's had a hard time giving up meat. He's never in his life thought he'd enjoyed tofu but after cooking this for dinner tonight, he absolutely LOVES it! Thank you so much for this recipe!! I made this tonight and it was great! I didn't have a wire rack, so I just used a baking sheet with some olive oil. Very tasty. Thanks!